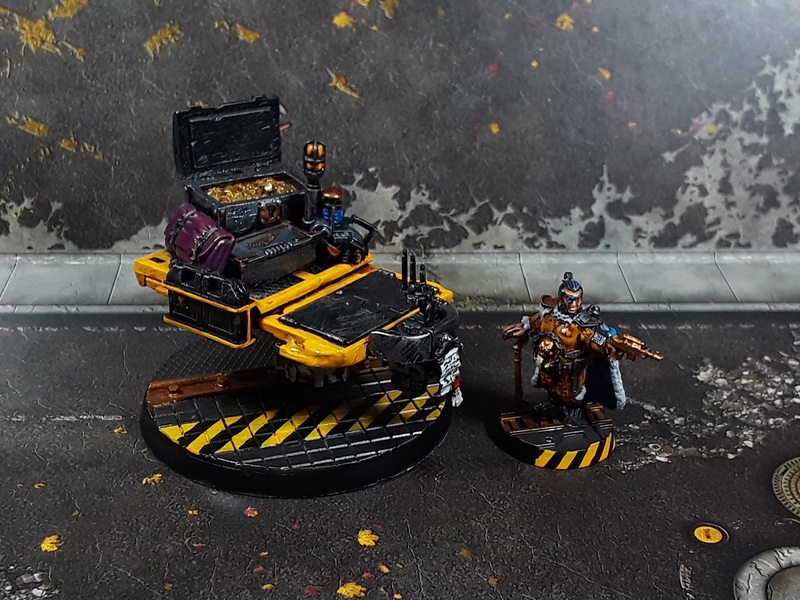 Mordian 7th Regiment: Necromunda - Count DeMonet's Guilder Caravan and Traveling Show ready for Adepticon! 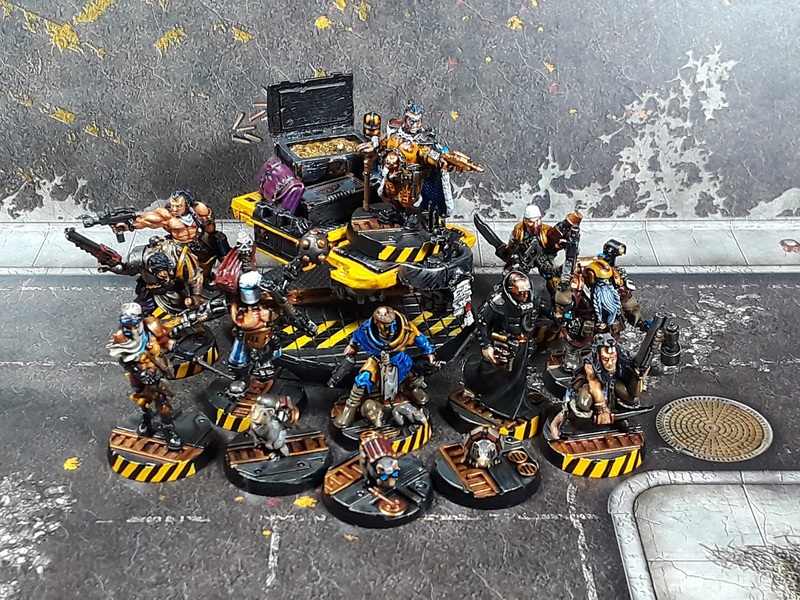 Necromunda - Count DeMonet's Guilder Caravan and Traveling Show ready for Adepticon! The whole crew ready to made a trip to the Underhive! Really jazzed with how they turned out - While they may not be super effective, they definitely have a ton of character! Played a few more games locally with them to get a better handle on the rules and work out any kinks in the crew list that needed addressing before the event. Dug up the prior incarnation's cargo skiff/flying carpet and rebased it to act as a gang relic/objective marker should the scenario call for it. Count DeMonet had a few equipment tweaks and now carries a hot-hot laspistol and a stiletto sword cunningly disguised within his walking cane! Of the two champions, Dr. Whirlygig was pretty much spot-on and has been a stand-out in every scenario he's taken part in. Some combat drugs coupled with the Count's Overseer skill and he's a cavalcade of pain! I did have to build and speed paint a replacement Mr. Hand, as his previous incarnation was carrying way too much superfluous weaponry. The addition of the Mono-sight and a clip harness should keep him well out of harm's way while still blasting opponents with wild abandon. 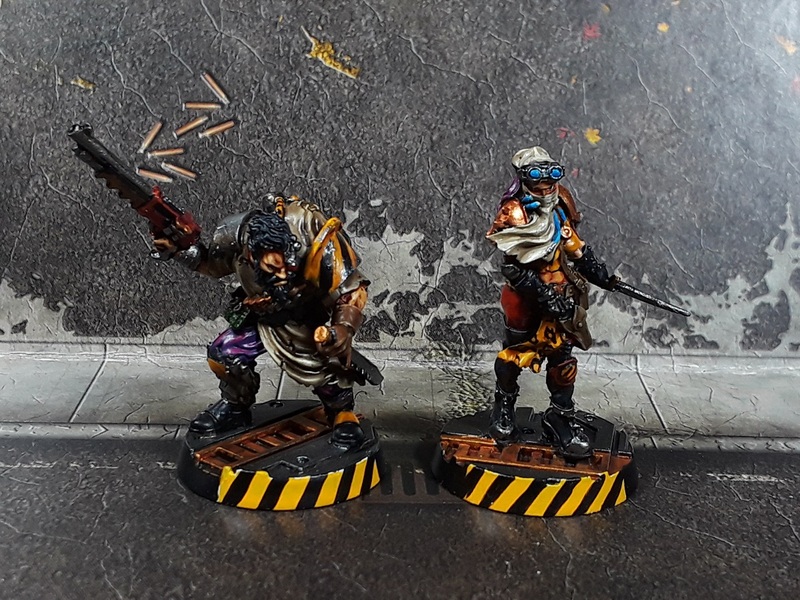 The husband and wife team of Harry the Hump and Minka the Ninker don't get much glory on the table but they consistently survive the encounters and keep the pressure on their opponents while the more flashy members of the team do the dirty work. Two new gunslingers were added to the roster each bringing some short ranged but powerful weapons. Biceps McSixpack is a danger to himself and others with his plasma pistol, while Frellin' Tom's hand flamer packs a big template in a small pistol! 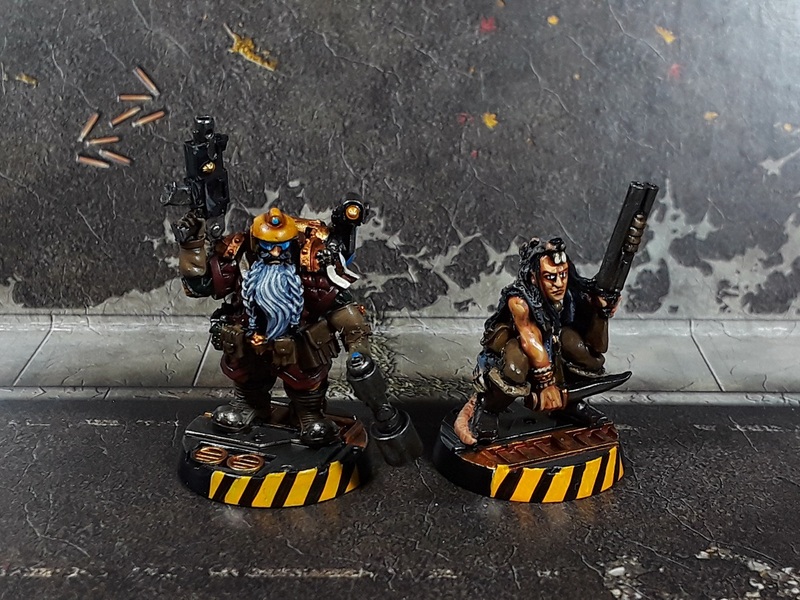 Another addition to the crew is the Squat adventurer Stump Chunkman, whose bolter always seems to run out of ammo on the very first pull of the trigger. Luckily he's no slouch with a mallet! The ratskin scout Eats Bad Fungus is a perennial favorite, sneaking up along the sides before blasting away with his shotgun or stealthily skewering sentries as the situation calls for. 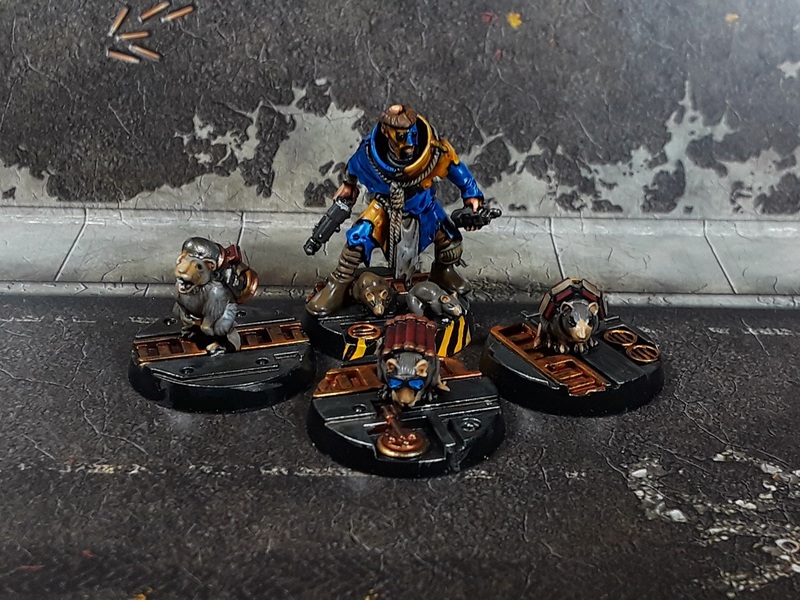 Last but not least is Brother Hameln and his bomb rats. Not once has his furry little ordnance managed to do anything but be comic relief, however I just can't help but take him in the list! Really looking forward to the event at Adepticon, and can't wait to see what other wild and wonderful crews will be taking part! These guys are awesome! So much cool detail, and they each tell their own story, but they still fit together as a group really well. The "flying carpet" is fantastic, and I may have to do something similar for an Inquisitor's retinue or something. Thanks very much! It was a fun little addition to the crew, made from a razorback top hatch, a couple bits from a landspeeder kit and some miscellaneous treasure piles. Easy peasy! 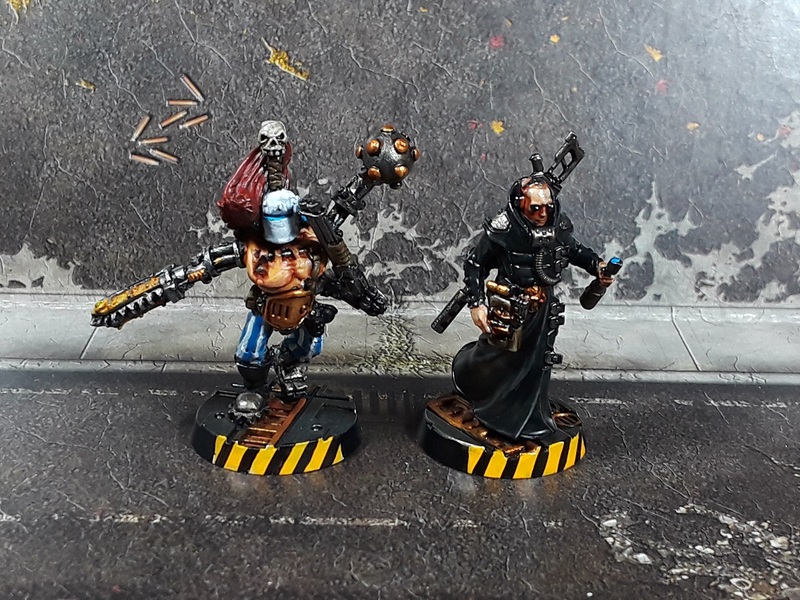 Is that the Necromunda version of Tenser's Floating Disk? So much awesome. Harry the Hump is my favourite but the bomb rats are absolutely mint. Haha! Indeed! 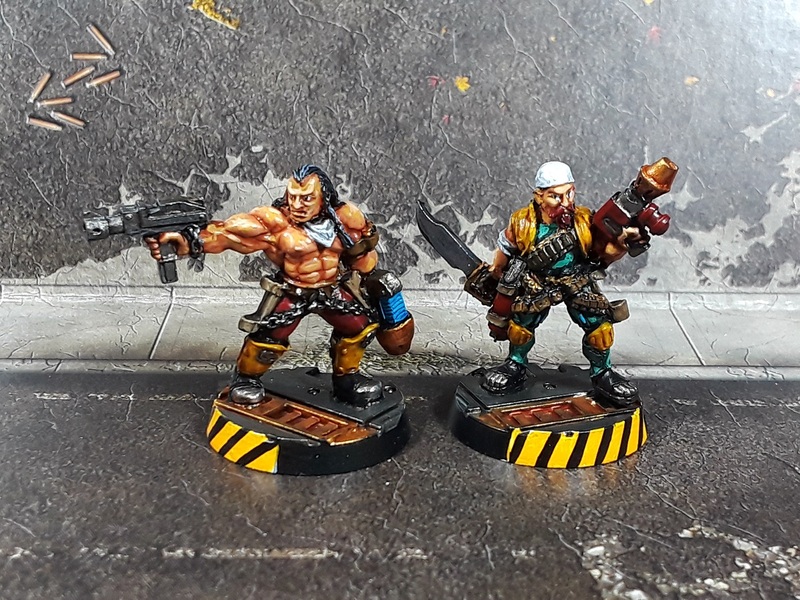 Aye, the anvil bomb rats are just awesome, going to have to get some of the new forge world ones as well and have a whole menagerie! I love the Grav-Skiff, it's a great idea for a Guilder Caravan where space as at a premium because of all the hovels and sundry bits of machinery that litter the Hive. The Ratskin has to be my favourite but they all look full of character...is it just me or does Frellin Tom look like Edge from U2? 'Eats Bad Fungus' lol, love it! That's a fine looking bunch overall, hope ya have fun with 'em! Haha! Should be a good time, and at the very least I hope my opponents will get a chuckle out of 'em! Fantastic. Loving their names, super work as usual. Thanks much, man! It's been a blast working on 'em! You might have already said it, but is Mr Hand a Dark City reference? I love that film! Hope the event went well. The crew look great. Indeed it did! I'll post up some shots from the show very soon! Love seeing more MRM minis out in the wild xD Great looking team man. Cheers! Aye, a ton of folks asked where he came from and I pointed 'em over to Mad Robot! Heresy Era World Eaters - Ready for Adepticon! Heresy Era World Eaters - Dreadnoughts complete!